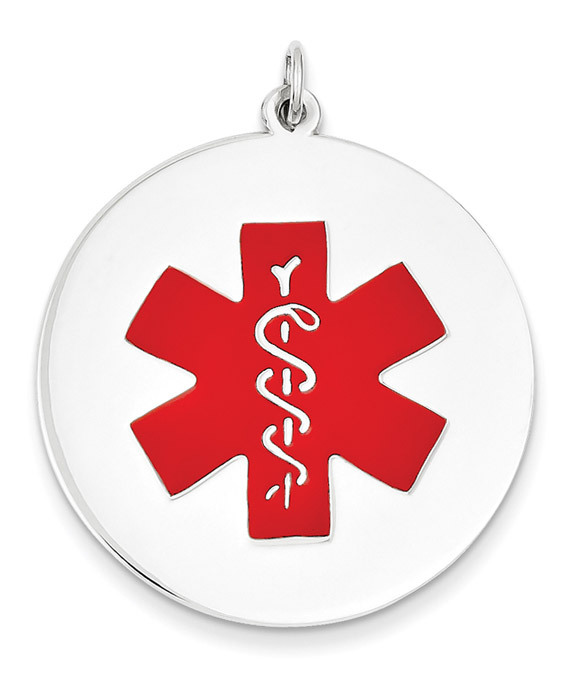 Large enough to fit all of your necessary medical information, this 14k solid white gold medical ID Alert pendant necklace with red enameled medical symbol on front, measures over 1 3/16" in diameter (or just under 1 1/2" tall with hoop/bale). Engrave the back of the white gold medical id pendant with up to 4 lines and up to 12 characters per line (including spaces). We engrave using Block font for legibility and easy reading. If you prefer a Script or other font, please let us know. The pendant normally ships within 1 business day, but please allow an additional 2-3 business days if you choose to engrave it. The medical alert pendant weighs approx. 8.3 grams of 14k solid white gold. Our 14k white gold medical id pendant necklace is made in the U.S.A.! Also available in various sizes and also yellow gold, shown below. You can also add a 14k solid white gold box chain necklace in 18" or 20" (optional). We guarantee our Large 14K White Gold Medical ID Pendant Necklace to be high quality, authentic jewelry, as described above.